*3CD Set Bringing together Bardo Pond’s three exclusive Record Store Day EPs from the last three years* "Bardo Pond’s first Record Store Day EP ‘Rise Above It All’ was a breath of fresh air. Their explosive interpretations of Funkadelic's, ‘Maggot Brain and Pharoah Sanders' ‘The Creator Has a Master Plan’ are epic performance pieces, taking the listener through a range of emotions as the band explore their innermost creativity. "These tracks represent the apex of sublimity for us” explains Michael Gibbons, “They are archetypes for our way of making music. They both offer the listener a mainline to an emotional epiphany that can only be experienced through listening to these very songs. Through seemingly minimal means, gut wrenching tones and glorious repetition, a gateway opens, endorphins are released, illumination is attained. With their humble ethos stunningly executed, RSD 2014 brought the second in what naturally started to look like a series. ‘Looking for Another Place’ was a continuation of their exploration and interpretations, this time they turned their attention to 'Ride Into The Sun' by the Velvet Underground and 'Here Come The Warm Jets' by Brian Eno. The results are astounding. The final instalment (RSD 2015) ‘Is There a Heaven?’ closes the series. 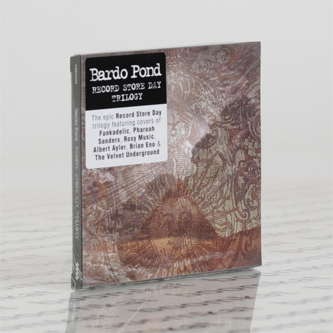 Bryan Ferry's 'In Every Dream Home A Heartache' and Albert Ayler's 'Music Is the Healing Force of the Universe' are the subject of Bardo Pond’s feedback drenched, heartfelt and considered attention. Loosely formed in 1989 by guitar wielding art student siblings, Michael and John Gibbons, Bardo Pond became a reality in 1991 with the addition of vocalist and flautist, Isobel Sollenberger, bassist, Clint Takeda and drummer, Joe Culver (replaced in 1999 by trainee librarian, Ed Farnsworth). Bardo Pond are the flagship band of Philly's "Psychedelphia" space rock movement, which also included the likes of Aspera, Asteroid No. 4 and the Azusa Plane"